On Wednesday, we began a series of looking at the noise in the press, the courts and even on Capitol Hill regarding airline ticket distribution. The GDS companies are at the center of the debate. Global Distribution Systems are the tool that is used by most agencies to access airline inventory and to manage the sale and reporting of those transactions for their customers. Today's post will focus on the difference in revenues generated from the sale of domestic airline tickets for the travel agency channels. The data is provided by the Airlines Reporting Corporation (known as ARC). As background, ARC settles transactions for the Mega Travel Management Companies (Amex, CWT, BCD, HRG, Maritz, Omega, CWT/SATO, SATO), the Online Travel Agencies (OTAs) and the other brick and mortar agencies. 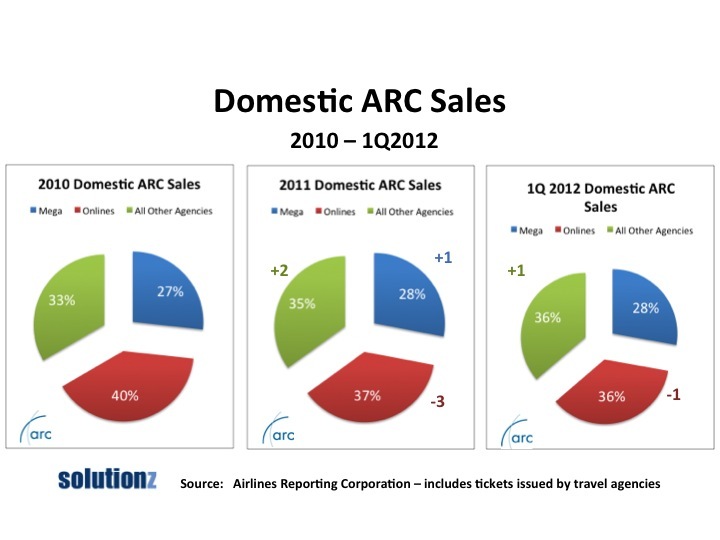 All told, as of April 2012, there are 13,896 ARC approved travel agencies in the US. It is no secret that the airlines have been making a move to shift distribution from what they perceive to be the high cost, GDS powered travel agency channel to their own direct distribution (aka websites or direct connections to the agency community). As we have shown in the previous posts in this series, the brick and mortar agencies issue tickets that are on average significantly higher in average fares than their online counterparts. The unspoken statistic here is that the airline's own website nearly always matches or beats the OTA prices, so the conclusion is that the Mega agency and the other brick and mortar agencies in the US produce a higher yield than even the airline's own consumer direct distribution, even taking into consideration commissions, overrides and GDS booking fees). It is tough for the airline to make this up in volume. 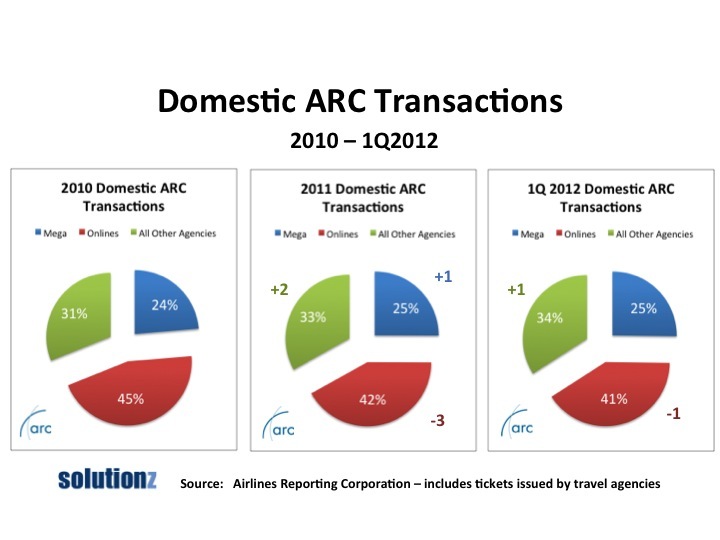 Over the past 2+ years, the airlines have been successful in shifting agency distribution away from the OTA channel. The OTA not only produces a lower yield, but the airlines in many cases still pay incentives to those agencies, thus lowering further the net profit on those tickets. The share shift since 2010 has been 4 points. The beneficiaries of that shift are the "Other Agencies", which have picked up 3 share points and the Mega Agencies have come up one share point. As the brick and mortar share goes up, so should the airline profits. Hmmmm.... so why don't we hear more airline announcements on board urging the passengers to support their local travel agency?? If you are working over the weekend (and who doesn't...), we'll wrap up this series, looking at the international side of the debate. Yesterday we took a look at the average airfares per channel, but viewed in isolation, those numbers are not as meaningful. Today, we are going to look at the domestic air transaction volume by agency channel. I would like to thank the Airlines Reporting Corporation (known as ARC) for providing the data for today's post. ARC settles transactions for the Mega Travel Management Companies (Amex, CWT, BCD, HRG, Maritz, Omega, CWT/SATO, SATO), the Online Travel Agencies (OTAs) and the other brick and mortar agencies. 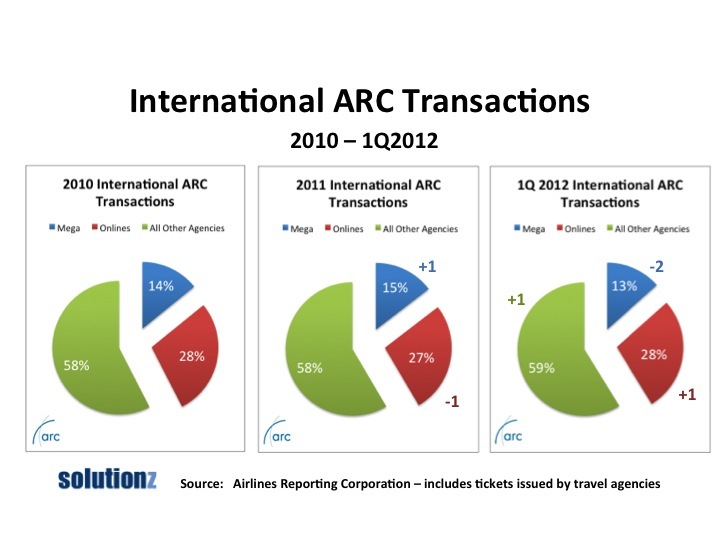 All told, as of April 2012, there are 13,896 ARC approved travel agencies in the US. From all the noise that we hear in the press, if you would close your eyes and try to create this chart progression, from 2010 to the 1Q of 2012, I think most of you would say that online has gained on the traditional travel agency channels (Mega plus the other Agencies). This is not the case. In 2011, the OTAs lost 3 points of share to their brick and mortar counterparts, with the Megas picking up 1% share and the other agencies picking up 2 points of share. In the 1st Quarter of 2012, the share held by the Megas remained the same, with the other brick and mortar agencies picking up 1% share over the OTAs. So, with the higher yields from both Mega and All Other Agency categories, the overall picture from agencies distribution (even with commissions, overrides and GDS fees) is still a positive one for the airlines, with 59% of their distribution coming from the higher yield channels and just 41% from the OTAs. Stay tuned tomorrow to see what this picture looks like when we look at the revenue split for domestic air transactions. With all the noise over airline distribution, how has it really changed since 2010? For well more than a decade, I've been analyzing the changes taking place in airline ticket distribution here in the US. There is a lot of noise over this issue, particularly as the airlines continue to invest in direct distribution and their online presence. Nothing quiets noise quite like the facts. Today's post will focus on the difference in airfares for the travel agency channels. The data is provided by the Airlines Reporting Corporation (known as ARC). Let's start with the average airfare for each channel. Yesterday I wrote about this for the most recent quarter in 2012. Here is a picture of how this has changed since 2010. In 2011, domestic airfares increased 7% each for the Mega TMCs and 8% for all other brick and mortar agencies. 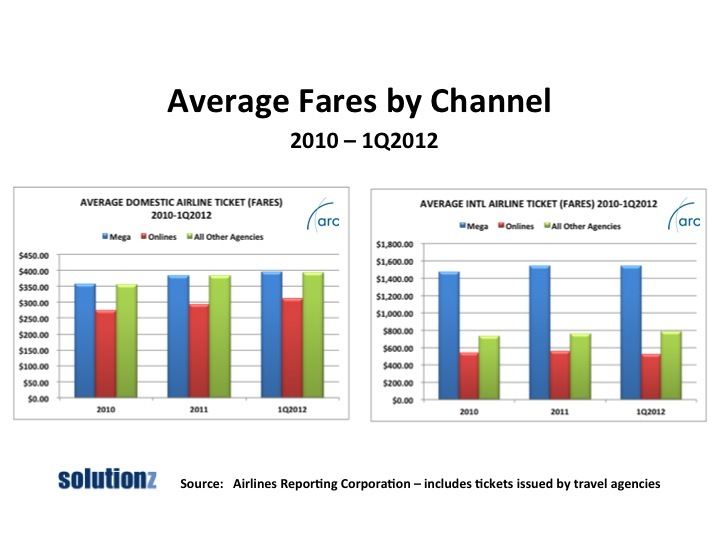 In the 1Q of 2012, domestic airfares increased 3% over full year 2011 each for Mega TMCs and all other brick and mortar agencies. Online domestic airfares went up 5% for the same period. In measuring their effectiveness as a distribution channel, the Mega and brick and mortar agencies consistently produce higher average ticket prices (and as a result, a much higher yield) for the airlines than their online travel agency counterparts. In 2011, international airfares increased 5%, 4% and 3% respectively for Mega, Online and all other brick and mortar agencies over 2010. In the 1Q of 2012, international airfares increased 4% over full year 2011 each for brick and mortar agencies. Mega agency average fares remained basically the same. Online agencies were the only ones that saw a decrease at 7%. In measuring their effectiveness as a distribution channel for international tickets, the Mega agencies consistently produce highest average ticket prices (and as a result, a much higher yield) for the airlines than their online travel agency counterparts. Brick and mortar agencies produce higher average ticket prices (and as a result a higher yield) than online travel agencies. Tomorrow's post will focus on the changes in Domestic Air Transaction Volume.